I have had the distinct honor of meeting, and attending lectures and retreat workshops presented by, Dr. Sara Lawrence-Lightfoot a few times over the years. Dr. Lawrence-Lightfoot is the Emily Hargroves Fisher* Professor of Education at Harvard University. She is a sociologist who examines the culture of schools, the broad ecology of education, and the relationship between human development and social change. With the fall parent-teacher conferences on the horizon, and with a keen interest in the home-school partnership and all that we value about it at BFS, I offer the following post and videos (and, if the second video appears too long, watch the first video, and I’d suggest stepping into the second one at the 23:00 mark). 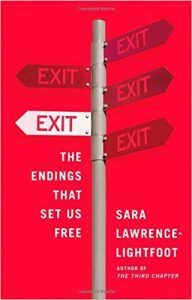 “With the insights she has gleaned from her close and subtle observation of parent-teacher conferences, renowned Harvard University professor Sara Lawrence-Lightfoot has written a wise, useful book about the ways in which parents and teachers can make the most of their essential conversation—the dialogue between the most vital people in a child’s life. 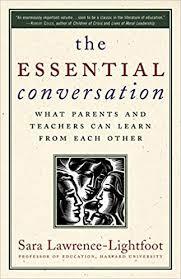 “The essential conversation” is the crucial exchange that occurs between parents and teachers—a dialogue that takes place more than one hundred million times a year across our country and is both mirror of and metaphor for the larger cultural forces that define family-school relationships and shape the development of our children. Participating in this twice-yearly ritual, so friendly and benign in its apparent goals, parents and teachers are often wracked with anxiety. In a meeting marked by decorum and politeness, they frequently exhibit wariness and assume defensive postures. Even though the conversation appears to be focused on the student, adults may find themselves playing out their own childhood histories, insecurities, and fears. She is lovely! So wise and articulate. How wonderful that she has chosen to focus on delving into this “ritual” during her career. I must say, however, that in my experience here at B.F.S., after conducting and participating in hundreds of parent-teacher conferences and conversations over 30+ years, I wholly enjoyed those encounters. What a great opportunity to share in mutual admiration and affection for children! The kind of connection I truly value! And I think parents here come to understand that that is the overriding approach and tone of those times together. 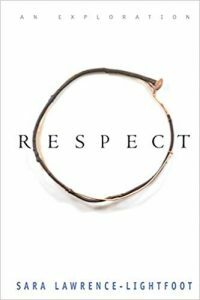 While I can imagine the prospect of a teacher conference could initially make a parent feel somewhat apprehensive, the reality of majority of those encounters in my experience was more characterized by the kind of shared learning and mutual respect, and respect for the child, than otherwise. Nonetheless, a very timely and thought-provoking topic, Paul! Thank you! Nancy thanks for bringing this up. In my experience at BFS conferences have not been ridden with anxiety or defensiveness, but a spirit of collaboration. I also believe Jessica brings up a good point in terms of duration of the conferences and structure of content – sometimes more focused on curriculum than child performance. My other take listening to Lawrence-Lightfoot is that parents bring their own personal history to the table – but so do teachers and institutions. What I may define as a “nurturing environment” may be too structured or too lax for another family. That’s when clear communication and explicit rules and goals can bring us to a common ground. Last but not least, I am very much looking forward to our first conference this year! -One, is the 10 minute time slots (yes?) In order to fulfill this deeper vision, we would first need to revisit the conference scheduling to allow more time for meaningful exchange. -Two, is the structure of the conferences: Perhaps there could be some idea-sharing about ways to structure that time to alleviate some of the anxiety that Lightfoot talks about. As a parent, I always feel like time is well spent talking less about grades and more about the content of what the student is learning. I am always appreciative when I get to see actual student work in the conference – any work, but especially student writing because that carries across everything – and when there is a chance to talk specifically about that work. I really appreciate any time we have to dialogue in that way. Thanks for sharing, Paul. This is good food for thought.